Taking care of your teeth involves proper tooth brushing, the use of dental floss, and regular visits to the dentist. However, there are times when proper oral hygiene practices are not enough to protect the teeth, and mouth. This is especially true when you engage in contact sports where there is a risk of damage to the front teeth. In this case, you will need additional protection to ensure that your teeth and your whole smile are safe from injuries. Mouth guards can protect your teeth, gums, and lips from being injured during sports, so that you can confidently enjoy your favourite sport without worrying too much about a serious teeth/mouth injury. These dental appliances are created to fit comfortably over your teeth to provide a safety cushion, preventing serious injury when your face or mouth area is hit accidentally with a significant amount of force. Mouth guards can also be used to address teeth grinding problems which can result in soreness of the jaw muscles and wearing away of the teeth. Stock Mouthguards – These are the ready to use mouth guard types, and can be bought from sporting goods shops. The ready to use nature of these mouth guards, however, mean that they are not custom-made to fit perfectly over your teeth and inside your mouth. Stock mouth guards have a tendency to be uncomfortable when worn, and may provide little protection during sports. Mouth Adapted or Boil and Bite Mouth Guards – These mouth guards need to be softened with hot water, and then molded around the teeth to provide a comfortable fit. Boil and bite mouth guards are also available in sporting goods stores, and can generally give better protection compared to stock mouth guards since they fit better inside the mouth. Custom-Made or Customised Mouth Guards – These mouth guards are custom-made using your own dental impression, and are created in a dental laboratory. The customised nature of these mouth guards mean that they will perfectly fit inside your mouth, and are comfortable when worn. 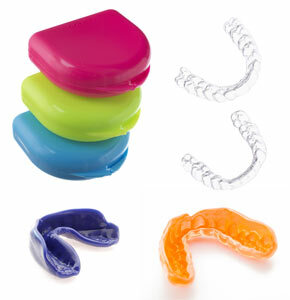 Custom-made mouth guards also give the highest level of protection from sports injuries.